＊a note to listeners: this episode has a fight scene that may be scary. If parents would like to preview this episode first, the script is posted below. Eyes bright with tears, the Monkey hopped onto his Jindou cloud to return to The Mountain of Flower and Fruit. Ah! What a Monkey King! 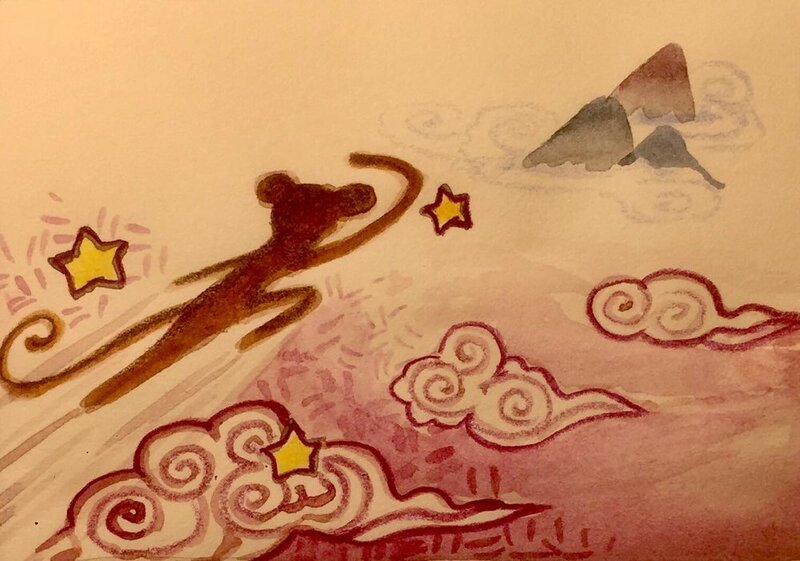 A trip that had once taken 10 long years passed by in a single somersault: for one Jindou cloud took Wukong back to The Mountain of Flower and Fruit! Black thunder clouds cloaked the Mountain of Flower and Fruit…and Wukong could hear the sound of crying! He shouted: "Monkey’s, I have returned!" At the Monkey King’s call, hundreds of Monkeys leapt out from the trees. Their faces shined with tears. "Great King, you’ve finally returned! We were afraid that if you still didn’t return, we would lose our home for good!" Shocked， Wukong asked: "What on earth has happened? Tell me immediately!" "After you left, there came a demon who called himself the monstrous King of Havoc. He comes in the clouds and leaves with the mist…and each time he comes, he steals our children to be his slaves!" Furious, Wukong shouted: "Where is this monster now? I will go rescue our little ones and teach this demon a lesson too! " "Great King", a monkey replied, "this monstrous king lives in the Northern Mountains not far from here…" Before the Monkey’s last word left his lips, the Wukong was off! In one leaping Jindou cloud, he sped towards the northern mountains. Arriving at the Monstrous King’s cave, Wukong began to knock furiously on the door: bam bam bam! Who dares to disturb my door? Do you not know who I am? "I don’t care what kind of despicable monster you are", Wukong said, "but you stole our little monkeys and I have come to settle a score!" Inside the cave, the monstrous king gnashed his horrible teeth. He donned his armor, picked up a big iron blade, and stormed out of the cave. The Monstrous king saw Wukong and stopped short. He saw that Wukong had neither armor nor any weapons! The Monstrous King roared with laughter: Muaaahahhaah! He pointed his blade straight at Wukong’s nose: "I was just feeling hungry for monkey meat! I’ll eat you first! Then, if I’m still hungry, I’ll eat those little monkeys!" Wukong howled with rage! "Demon! You want to eat? Eat this!" And with a great leap forward, Wukong aimed a mighty punch straight to the monster’s head! In a split second, those hairs had changed into a hundred little Wukongs! The little Wukongs surrounded the monstrous king. They jumped on him, pulling at his arms, tearing at his ears, and tickling his armpits! One little Wukong even grabbed the iron blade out from the monstrous King’s hand! The Monstrous King’s eyes blazed red with rage. He opened a blood red mouth to eat the little Wukongs whole! The real Wukong roared! With the Monstrous King’s iron blade in hand, he aimed a blow straight at the monster’s head. Kaaaaaaaa! A flash of green light… and the monstrous king exploded into a cloud of black smoke, disappearing forever. And from inside the monster’s cave, several dozen little heads popped into view! Come, my little ones! Wukong smiled. I’m taking you home! Hi Panda Cubs, we end our story here for today. What happened after the Monkey King Sun Wukong brought the little monkeys back to Hua Guo Shan? We will continue this story, next time! For the first 100 days of 2018, I’ll take us through the 100 most commonly used Chinese Characters – explaining etymology and providing examples along the way! After that, we’ll move on to the next 200, 300 characters etc. My goal is to here is to help us reach basic reading proficiency by the end of 2019... and become increasingly literate going forward! I’ll be updating the panda Instagram so follow us to keep up!